I must have driven past this place on the corner of Johnston St and Wellington Rd in Collingwood hundreds of times before a laksa craving got the better of me and I found myself here for dinner. It’s a brightly coloured exterior with big signs advertising MEE REBUS and all food Singaporean and authentic. 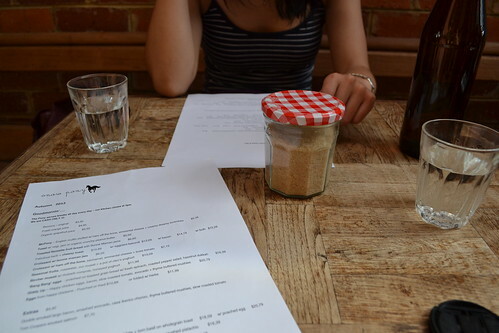 Inside, it’s cosy, with pink walls and very friendly staff giving the place a homely, family-run atmosphere. 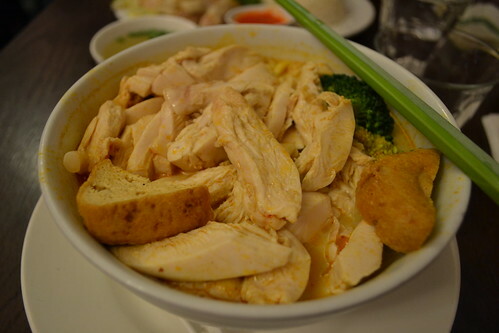 I had the chicken laksa and can I just say, so MUCH chicken!!! I had a much more photogenic photo of the presentation of the dish, but it wouldn’t convey the sheer protein monstrosity that is this dish. Do you see any noodle in this picture? No, didn’t think so. This laksa is awesome! Great flavours, creamy broth to warm you up and chicken that is tender and free from tendons and other stringy bits. Lovely! 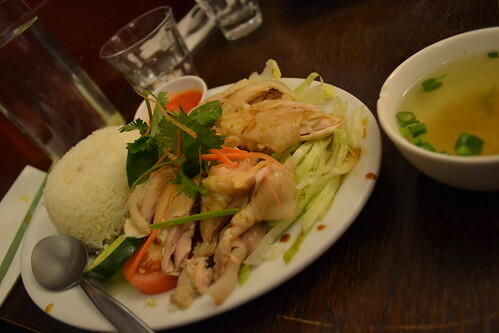 We also had the chicken rice. Again, awesome chicken, done right and on the slightly rarer side. 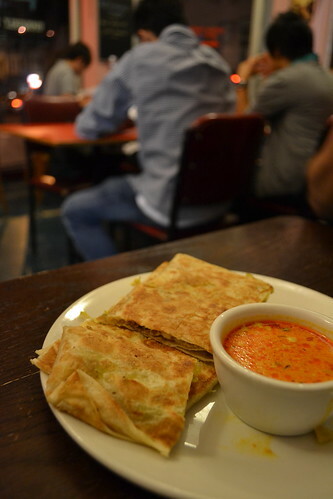 We also shared some sort of roti with some deliciously creamy and rich dipping sauce. Yum. No chicken though. A great find! A lovely place for dinner that is reasonably priced and generously portioned. Win. After a superlongextended hiatus sustained by job applications and some serious planning for imminent europe travels (yay! so excited!) I’m back with more pretty food pictures! One of my favourite brunch spots in the collingwood/brunswick/abbotsford area. I used to get it confused with Proud Mary, both are found on a corner in a red bricked ex-industrial building block. 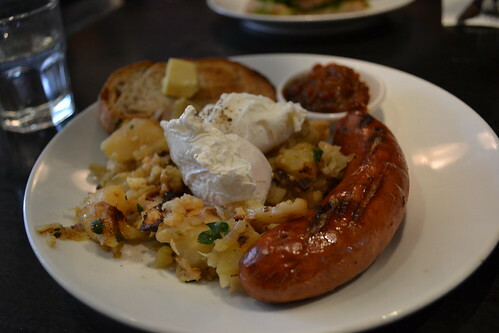 But I Proud Mary to on the more experimental side with their dishes, particularly in the domain of breakfast sauces and condiments, and more on the small side in terms of serving size.. while Three Bags Full has a hearty menu that never fails to disappoint. Also bonus: they’ve opened a space to the side of the original cafe which eases the load on the saturday morning queues – even if just a little. 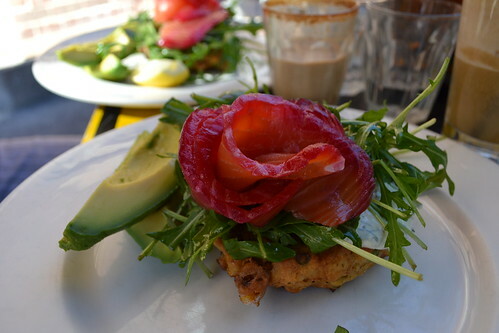 This time around I had the beetroot cured salmon with corn, pea and feta fritter, avocado, rocket with dill sour cream. A whole lot of yum. I’ve been hooked on all varieties of cured fish since my revelation at De Clieu. Such lively and vibrant presentation, so much love for this dish. 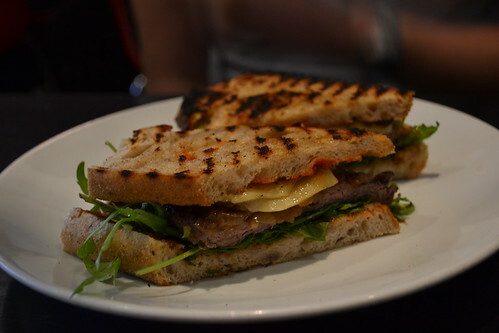 I can also highly recommend the black angus steak sandwich. If you’re up for meat on your saturday morning, this is a very very very satisfying investment. Some pretty serious discussion also took place, including such #firstworldproblems as our itinerary through the south of france, exactly how many times we would need to cross the charles bridge for full effect and wether or not a weekend in greece would be too extravagant (the answer, sadly – yes). 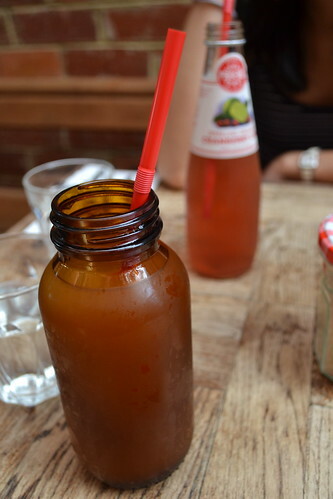 My cute grapefruit juice in a jar + straw. Tasted… healthy. And by that I mean kind of sour and bitter haha, precisely what a fresh grapefruit juice should taste like, my brain must have temporarily been distracted while I was ordering. 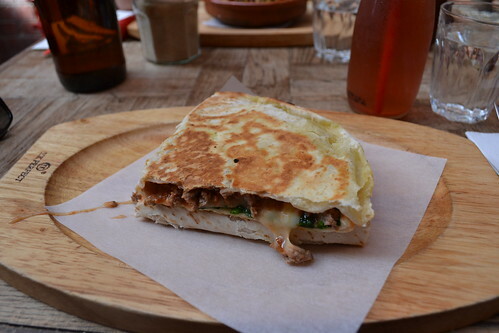 My friend’s toasted piadini. Can’t remember the filling exactly, but was pretty yummy. My happy chicken pilaf. I think while heavily intoxicated by thoughts of the amalfi coast, my mind replaced the word pilaf with salad and so when my order came, I was surprised that I was in for a rather more substantial meal than I had thought. Oh well. 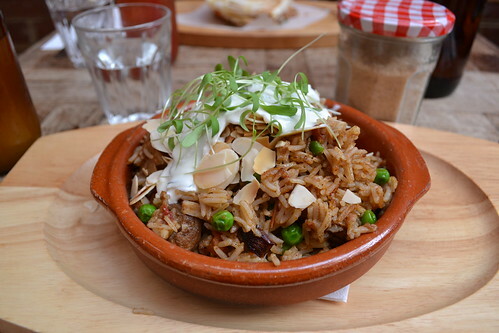 What seemed like a little portion in the shallow dish was in fact a very filling serve of spiced rice studded with pieces of chicken with a hint of chilli and topped with the cooling tang of yoghurt. Pretty damn good, but it was quite rich and I struggled to finish a little bit. A most excellent and satisfying brunch. Will be back for a more detailed perusal of the menu when my mind is a little less distracted! 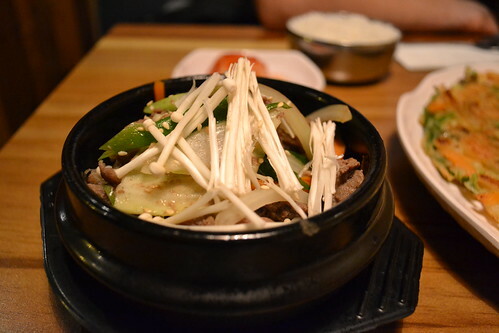 Dinner the other night @ Joomak, a cosy korean place right near melbourne central. It’s a tricky place to find, there are no signs on the street but poke your head into one of the anonymous looking buildings with a lobby and you should see their bold cheerful sign peeking out from under some stairs. The basement location is pretty cool, with individual booths customized to seat 2 or 4s (or more). And by booths I don’t mean the ones you find at TGI Fridays, this stuff is the real deal with wooden fencing and even a thatched roof. Cute. We never really know what to order at korean restaurants besides our usual combo of seafood pancake + glass noodle +/- bi bam bap +/- korean fried chicken. Sorry to say, this meal wasn’t too different and we were too conservative to give the cheese egg roll, or the giblets a try… maybe next time. All the food was done well with nothing to fault. Having said that, nothing really stood out either, but I guess that’s probably just my reluctance to be adventurous with their menu. 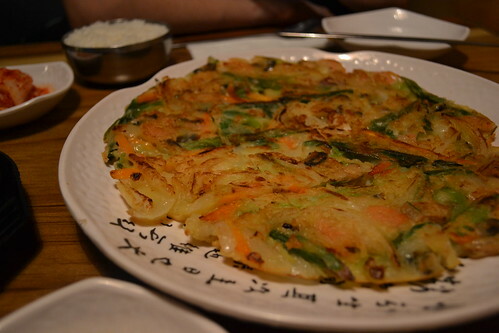 I do like going to korean places to see what side dishes they bring out with the meals – ? are these called kim chi… or is kim chi only that red spicy cabbage one? 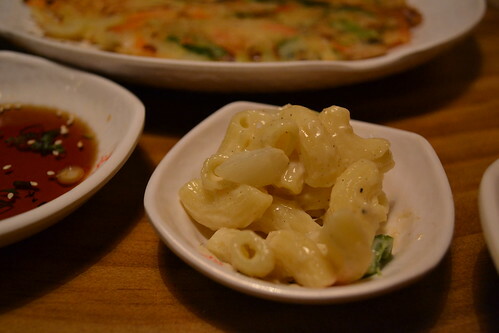 Anyway, Joomak had a cute macaroni one which I haven’t seen before. I would recommend Joomak for the private booths and nice food. They also do some decent rice wine with yummy sounding flavours, mango etc which is worth making the trip for. Taking advantage of the hot weather on Good Friday, we decided that a nice dose of refreshing, cold japanese was what we needed. 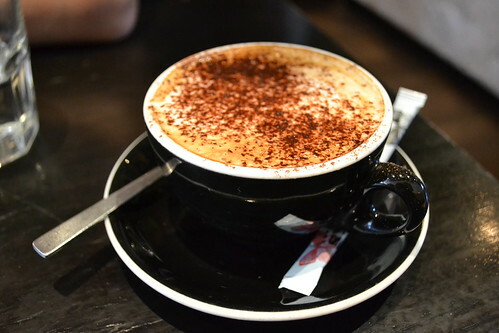 Our lovely dinner plans were foiled however by the inclemency of Melbourne weather and by the time we got ourselves organised and made our way to south yarra, it had started to pour with rain. Unfortunately no one had bothered to adjust the air conditioning inside so we were greeted with icy galacial blasts as we ran into the restaurant fresh from our drenching. Sigh. Now Gaijin markets itself as serving ‘fusion japanese’ cuisine, which I believe means that they’ve just westernized a whole lot of traditional japanese dishes – and from looking at their menu, mostly by adding cream cheese. So maybe it’s not the most delicate and innovative of ‘fusion’ cuisines around, but they do have some interesting flavours and textures (tempura crunch seems to be a big feature in their special sushi rolls). And the seafood is undeniably fresh, so a thumbs up there. 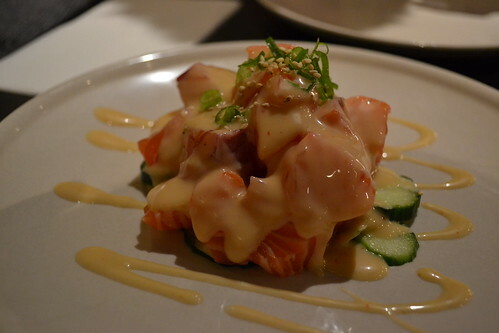 We started with a starter of Gaijin Special Salmon Salad ($9). Plump fatty salmon slices with a creamy dressing – not sure what it’s called, but its the one that has the hint of sesame? Whatever it is, addictive. Not much of a ‘salad’ though, more like salmon on a few slices of cucumber. 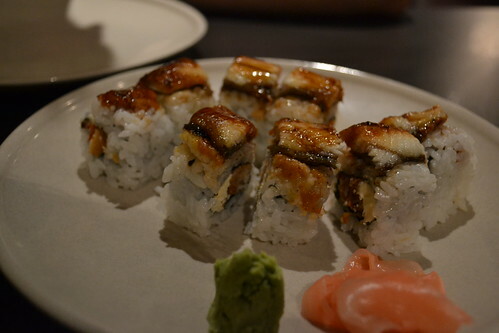 Spider vs Dragon Roll ($13): tempura crunch, soft shell crab, mayo, cream cheese and unagi slices. I’m pretty sure this is what I was thinking when I made the order: heaps of tasty ingredients together = awesome end product! Hmmm… not quite. Tasty, sure, but the individual components didn’t really come together and the cream cheese was just a bit odd. Dunno, probably just not my thing. 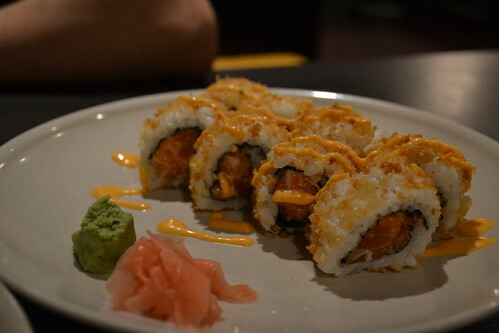 Crunchy Spicy Salmon Roll ($13). Tempura crunch, raw spicy salmon, gaijin sauce. Well we actually ordered crunchy spicy scallop, but at the time of photography I hadn’t yet realised the mistaken order. But for all intensive purposes they pretty much looked the same, variations on a theme. This one was really good, I’m a big fan of spicy and found this combination gave the sushi a bit of kick and bite. 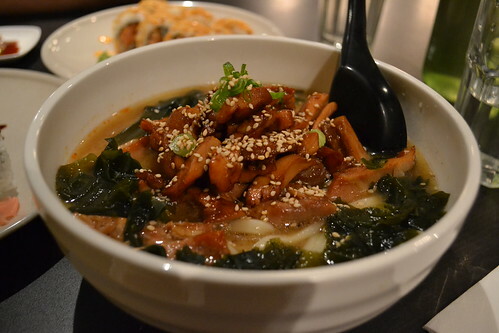 The chicken udon ($18). This was the dish to help warm us up after all the cold platters and did its work nicely. Thick, soft udon in a delicious umami broth with generous portions of well marinated chicken on top. Yums. Overall I thought it was quite a tasty meal, and not too expensive either. Good for a bit of fun and something different to your average Japanese food. 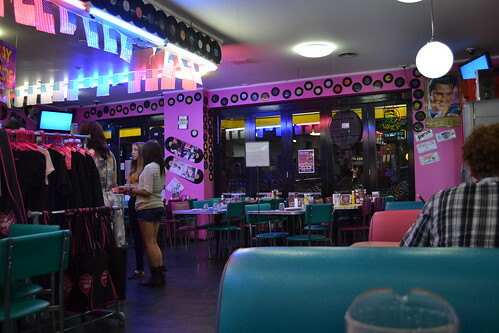 We wandered over to Misty’s Diner a couple of week’s ago for a post-dinner snack. Knowing full well their reputation for an authentic American style food and dedication to surpassing all legal quotas of all things sugary and deep fried, we felt it only safe to approach with a solid week of gym efforts under our belts. 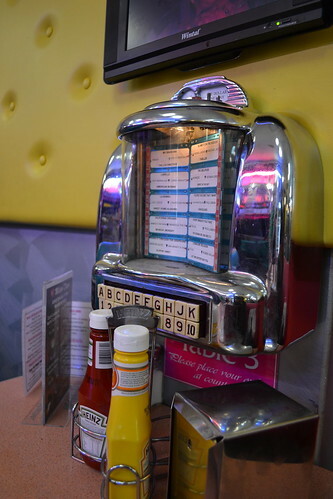 Inside, colourful booths and neon lights abound with a good smattering of American paraphernalia covering the walls – think flags, vinyls and license plates. 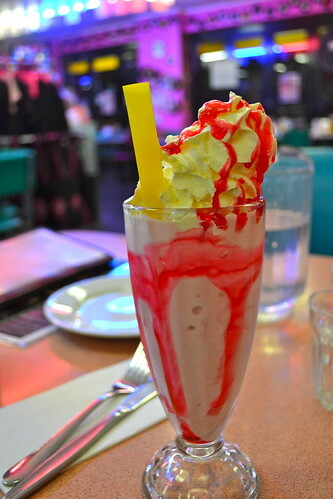 We decided to stick to desserts and ended up ordering: the strawberry and white chocolate thickshake – rather garish looking under the lights don’t you think? It was probably too sweet, but I think I was too busy gulping it down to notice. So tasty that I’m pretty sure I had some sort of reflexive sugar coma and was subsequently drowsy and disorientated for the 20 minutes following consumption. 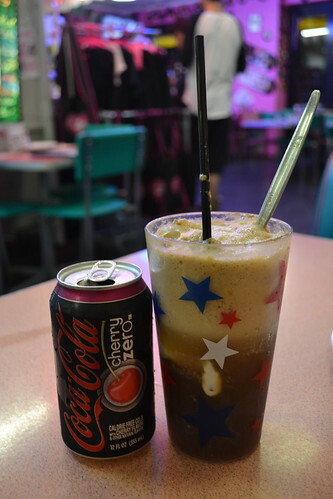 And we had an old school cherry coke spider. The soft serve was of an odd quality, but hey, you can’t really go wrong with a spider. 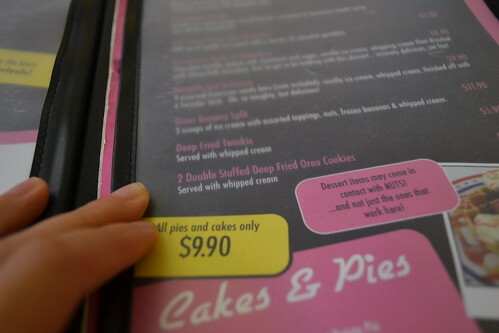 Also notice this on the dessert menu. Double stuffed deep fried oreos – it’s enough to clog your arteries just thinking about it. 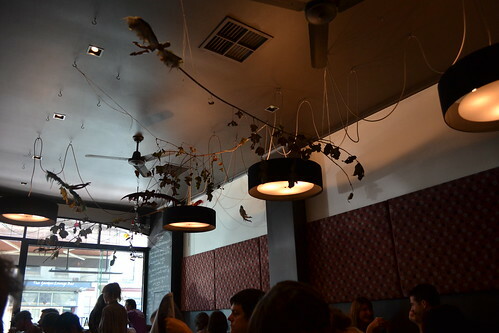 In fact, the rest of the menu was sort of amazing in a bizarrely fascinating way, full of a wide array of fried potato goods – curly fries, waffle fries, fried potato skins… – and ribs and wings … The more I read the more a perverse sort of craving developed. It’s just too unhealthy not to taste good. I will be testing this theory on my next visit.